A state attempt to create a retirement savings plan for 6 million private-sector California workers not offered one on the job, Secure Choice, got a boost last week during the White House Conference on Aging. President Obama said he has directed his labor department to propose rules showing states how to create what in California could be an “automatic IRA,” a payroll deduction that puts money into a tax-deferred savings plan unless workers opt out. The rules are expected to answer a key question: Is Secure Choice exempt from a federal retirement law, ERISA, that not only has employer administrative costs but may also expose employers to liability for failed investments and other problems? An ERISA exemption is one of several limits California legislation placed on Secure Choice: No state budget for development ($1 million was donated), self-sustaining when operating, IRS tax approval, and legislative approval of the final savings plan. The payroll deduction, believed to be an important way to increase retirement savings, is intended to be a supplement for Social Security. Nearly half of California workers are said to be on track to retire with incomes below $22,000 a year. Obama said Congress ignored repeated calls for an automatic IRA. Taking alternative action, he said the new labor rules will encourage a handful of states that have enacted new retirement savings plans and 20 other states considering similar plans. In May, the President received a letter from 26 U.S. senators urging clarification of federal labor and tax laws hampering states trying to develop retirement savings plans. California and Massachusetts were mentioned. In March, state Senate President Pro Tempore, Kevin De Leon, D-Los Angeles, the author of Secure Choice (SB 1234 in 2012) and state Treasurer John Chiang, whose office houses Secure Choice, met with Obama administration officials to discuss the bill. Chiang’s response was more cautious last week as he gave a previously scheduled update of Secure Choice to his fellow members of the California Public Employees Retirement System. Obama called on his labor secretary, Tom Perez, to propose the new rules by the end of the year. Chiang said Secure Choice hoped to be ready to take a plan to the Legislature by the end of the year, but could act quickly if the rules allow the plan. With the $1 million in donations, half from the Laura and John Arnold Foundation, a market analysis and plan design is being prepared by Overture Financial and others under a $500,000 contract. K&L Gates has a $275,000 legal services contract. In a blog post last week, Secretary Perez said a number of states have asked for clarity about whether their retirement savings plans would be “preempted or nullified” by ERISA, the federal Retirement Income Security Act. “Although the federal courts, not the Department of Labor, are the ultimate arbiter on that question, the department can try to help reduce the risk of litigation challenges to state retirement savings initiatives,” Perez said. The President told the aging conference last week that Social Security, the basic federal retirement system that would be supplemented by the savings plan, is not in “crisis” as often claimed by those who want to cut the program. Social Security, like Medicare, is “facing challenges” because of the “demographic trends” of the Baby Boomers, he said. A population bulge turning 65 at the rate of a quarter million a month also is expected to have a longer life span. 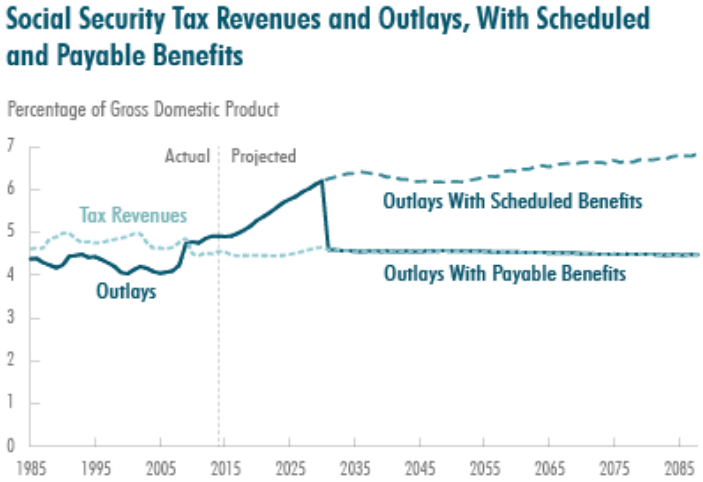 If a solution is not enacted before then, payments presumably would be reduced to the amount covered by annual Social Security tax revenue from employers and employees, currently 6.2 percent of pay from each each. Huff Stevens said Social Security funding gaps have been closed in the past. In 1975, the tax rate was increased and benefits reduced. In 1983, some benefits were taxed and retirement ages increased. A federal lobbyist, Tom Lussier, told the CalPERS board Congress seems unlikely to consider Social Security funding until after the presidential election last year. He said an apparently growing concern about retirement security may take the talks beyond cuts. “If we are really going to acknowledge the retirement security crisis that we are talking about, the discussion should be about expanding Social Security and making it a richer benefit as opposed to going the other way,” Lussier said. A third point made by the President last week, in addition to the retirement savings plan and Social Security solvency, is a proposed labor rule that attempts to “crack down” on self-serving financial advice sometimes given to consumers. “The goal here is to put an end to Wall Street brokers who benefit from backdoor payments or hidden fees at the expense of their clients,” Obama said. Lussier said another rule, pending at the labor department and in Congress, would require retirement savings and investment plans, such as IRAs and 401(k)s, to give individuals an estimate of their value at a normal retirement age. He said the belief is that “most people will be frightened” by the number and motivated to save more. This entry was posted on July 20, 2015 at 7:18 am and is filed under Secure Choice. You can follow any responses to this entry through the RSS 2.0 feed. You can skip to the end and leave a response. Pinging is currently not allowed. I hope if it passes, private sector workers demand that taxpayers retroactively fund a pension as rich as public sector workers get, with an equal claim on tax dollars. If they can retroactively increase pension for public sector workers in 1999 and have them absolutely guaranteed regardless of the consequences for others, why can’t they do the same for private sector workers? If the whole thing collapses, at least everyone would be equal again. The unions are pushing this simply as a matter of propaganda — see, you have a pension, and are just as well off as we are! That, of course, is not true under the proposal. LarryLittlefield’s last paragraph is on point ….. while increased Private Sector savings is a great idea, and forcing an opt-out to an automatic paycheck deduction deposited into a savings plan will help in that regard …. the Public Sector Union/worker support is simply their attempt to lower the RIGHTFUL pressure to VERY materially reduce THEIR grossly excessive (by any reasonable metric) taxpayer-funded PUBLIC Sector pensions and benefits …. ROUTINELY 3x-4x (4x-6x for Safety workers) greater in value at retirement than those of Private Sector workers retiring with the SAME pay, the SAME years of service, and the SAME age at retirement. Honestly I hope this works. Regardless of union involvement or whatever I think its important that people have the opportunity to invest in their future. They’re right in making the program automatic. It would be nice to choose different percentages to be taken from ones paycheck. for example 1%/3%/5%. A single or young person may be able to give more when they’re younger and dial it back or scale it forward as needed. I do this on my taxes for the state; I ask 50$ to be withheld from every paycheck and at the end of the year I go on vacation. yes its interest free but hey… somebody’s got to pay for those public pensions ;). Besides… I love my state. I’ve always thought that unions in the public sector are a burden and it would be nice to find a fair solution to detach the union and put in place laws that would continue fair treatment of employees (not that it doesn’t already do so). I’m all for collective bargaining rights when it comes to employee abuses, fair and equal treatment as well as fair pay but as they are government employees ARE well taken care of. Only WE can make a change for the better though.